Jackie Calderone, Director of Calderone Arts, has played many roles throughout her arts career including: presenter, funder, booking agent, fundraiser, evaluator, panelist, board member, educator, and artist. Calderone pulls from these diverse experiences to help organizations and individuals uncover a greater capacity to create, connect, and deepen relationships with their changing communities. Calderone also serves as the founding Director of TRANSIT ARTS, Artists on the Move, launched in 2007. TRANSIT ARTS, a program of Central Community House, engages young people throughout Columbus through the six members of the Columbus Federation of Settlements. TRANSIT ARTS is working in partnership with the Ohio Alliance for Arts Education and a wide variety of artists, arts organizations and other community-based organizations throughout Central Ohio. She received an Artists-in-Communities grant from the Ohio Arts Council in 2007 to create an interdisciplinary performance project in collaboration with a variety of outstanding Columbus-based artists and youth primarily based through TRANSIT ARTS. In 1998 Calderone was invited to become CAPA’s first Director of Education and in 1999 created the CAPACITY program, expanding on the model of Calderone’s innovative work with the nationally acclaimed Short Stop Teen Center. In October 2001 the CAPACITY Studios were opened in an economically challenged area of the near east side of Columbus. For six years this tiny complex was an explosion of creativity and home to CAPACITY’s gallery, workshops, offices and a beautiful youth-created garden/art space. CAPACITY touched thousands of teens in Central Ohio and received coast-to-coast acclaim through several national projects and commissions. Calderone was the creative force behind the Short Stop Teen Center and Third Avenue Performance Space. 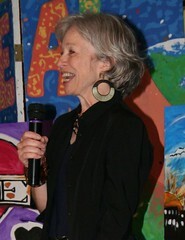 Her passion for community-based arts was sparked during her seven years at the Ohio Arts Council where she coordinated the Dance and Jazz Music programs. She has served on numerous National Endowment for the Arts panels and has designed and lead workshops for organizations which include Jacob’s Pillow Dance Festival, The National Performance Network, The Association of Performing Arts Presenters, Dance USA and many more. Until 1990 she performed with an ensemble directed by noted choreographer John Giffin and she continues to collaborate with her husband, national touring artist Robert Post. She has received numerous awards from organizations including Ohio Dance, the Ohio Arts Presenter's Network, the Hot Times Festival “Listen to the Jazz” Award, and the 2006 “Honored Artist” Award from the Columbus Community Festival (ComFest). She was honored for her civil rights contributions during the 2008 Martin Luther King, Jr. Birthday Celebration at Veterans Memorial, received the Arts Freedom Award from South Side Settlement in 2009, in 2010 received the Greater Columbus Arts Council's Community Arts Partnership Award for Arts Educator, and in 2012 received the Ohio Alliance for Arts Education's Virtuoso Award for "her innovative programs for central Ohio youth". Calderone is a member of the Ohio Art League, Ohio Dance and the Ohio Alliance for Arts Education, and currently serves on BalletMet’s Education Outreach Committee and the Fort Hayes Advisory Committee.